To freshen a kitchen, refinish the cabinets. Here are some tips on paint and step-by-step instructions. Want to give your kitchen a facelift without draining your wallet? Consider painting the cabinets. Wood cabinet refinishing entails removing the existing paint, sanding the surface (depending on the type of paint you are using) and applying new paint to the bare wood. This cosmetic project revives cabinets that have become scratched, faded or discolored, and breathes new life into an old kitchen. “Refinishing cabinets is a fantastic, cost-effective way to transform the look and feel of a kitchen,” says Dan DiClerico, home expert at HomeAdvisor, a remodeling project resource. It’s also a fraction of the cost of doing a full kitchen remodel, which runs, on average, $22,632, according to HomeAdvisor. Even replacing old kitchen cabinets with new cabinets starts at about $4,000 for a typical 10-by-12-foot kitchen, according to HouseLogic, an online resource for homeowners. HomeAdvisor says the average cost to repaint kitchen cabinets is about $1,000 — if you hire a professional. If you do it yourself, your base cost would be $200 to $600, depending on the brand of paint and the supplies you have to buy, according to the Kitchn, a kitchen design and renovation website. You might already own some of the supplies you’ll need. 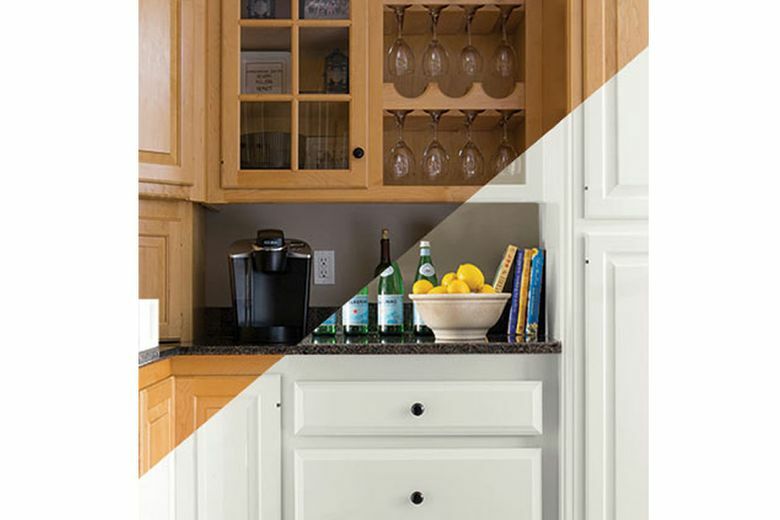 Though cabinet refinishing isn’t as large of an undertaking as a full kitchen remodel, it’s still a big project that takes time, patience and elbow grease. Before diving into step-by-step instructions, let’s look at how to choose the right paint. There are six types of interior paint, but DiClerico finds that either a semigloss or satin paint is best for cabinet refinishing. He says semigloss is the most durable and stain-resistant, and it won’t lose its luster if you scrub it with a sponge. Want a more modern look? “The trend in kitchens these days is for a softer matte look, including on countertops and floors, as opposed to the high polish that was popular a decade ago,” DiClerico says. There are also a number of specialty paints that can be used on cabinets. 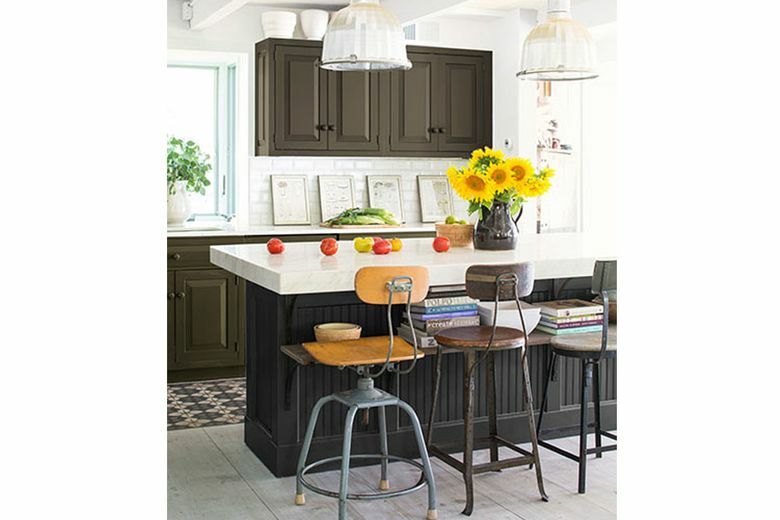 Chalkboard paint, for example, “could be a fun option, converting a cabinet or pantry door into a message center,” DiClerico says. Chalk paint (not the same as chalkboard paint) is a good option if you want to avoid sanding first — but it can require multiple coats and still appear uneven in places, according to designer and artist Jeanne Oliver. If you have doubts about which paint to select, ask for help at your local paint store. • First, remove all food and kitchen items from your cabinets and drawers. Then label all doors and drawers with their respective location so you can reinstall them correctly. Put labels on the inside of doors and drawers so they don’t interfere with the refinishing process, DiClerico says. • Remove the drawers, doors, knobs and other hardware with a screwdriver. (A little WD-40 can help you remove rusted hinges.) Store the items in a plastic bag if you’re going to reuse them. If you plan on installing new hardware in a different style, fill the existing hardware holes with wood putty. This gives you a clean surface to drill in the new hardware later. • Next, clean layers of grease and dirt off the cabinets using a wood cleaner, trisodium phosphate or mineral spirits. “If you don’t clean them, the new paint finish isn’t going to go on properly,” DiClerico says. • After the primer is applied, it’s time to paint the cabinets. DiClerico recommends applying two coats of paint using a high-quality paint brush, which will be able to reach any crevices in the door detail. (If you’re working with flat-fronted cabinets, a roller will do the trick.) For an even finish, “it’s a good idea to do a light sanding between coats with a fine-grit sandpaper, say 220-grit,” he says. • After painting, let the cabinets dry. “It might take a full day to let them dry depending on the humidity,” DiClerico says, and it will take the paint at least a week — and up to a month in some cases — to fully cure. Most people don’t want to live that long with an unfinished kitchen, but if you can wait a couple days before reattaching the doors and hardware, that will help protect the finish. If not, treat them gently for the first week or so, opening and closing softly, and avoid cleaning the painted surfaces with a sponge or cloth. Then step back and bask in the glory of your newly refinished kitchen.